Several people commented about my recent post Duality at the Islip Art Museum, where I am showing a two-panel abstract diptych in blue, black, white, green and gold ochre. See the image below. I submitted two images as digital files for review for this show. Scott Bluedorn was the juror who selected works in the exhibition. He is a long Island artist. His studio practice includes painting, drawing, collage, assemblage, installation, photography and cyanotype. He makes collages that are futuristic and Surrealistic.The exhibition is titled Duality: Glimpses of the Other Side and continues to September 17, 2017. Visit the Islip Art Museum, located at 50 Irish Lane, East Islip, NY on Long Island. Gallery hours are Th/F 10-4 and S/S 12-4. Blue Triangle Diptych is geometric abstraction in two parts (a diptych), 24 inches tall and 32 inches wide. The triangles are in different media and are arranged in a different pattern on each panel. One panel (on the left) is a collage made with painted papers. Every blue and black triangle is cut and pasted paper. One panel (on the right) is an acrylic painting. The paint is layered and I used tape to get sharp lines. The 2nd entry, seen nearby, was not accepted for the exhibition. It’s a diptych and all collage on two panels and made with blue and white painted papers arranged as triangles. I love the range of blue and soft green and white in the painted papers. I prefer this triangle diptych, but was happy the juror accepted one work for the exhibition. It made me wonder how he made his decision. One of the comments to the post came from Karen Rand Anderson, an artist who lives and works in Rhode Island. She writes a blog, She said she liked the blue and white diptych better than the one the juror selected. I told her I agreed, but said I assumed the juror wanted to see juxtaposition, per the exhibition title, and the piece he selected has more dialogue going on. Maybe I was wrong. Here’s a little information about how it works – and it’s important to understand the process is a crapshoot. You can never assume any work will be accepted – unless the show is an invitational and the juror (curator) tells you he/she wants a specific piece. By definition, an invitational is never a juried show. Artists enter juried exhibitions all the time for different reasons, sometimes for prize money and also to build their resume. The typical juried show includes one juror who looks at digital image files for every work submitted and selects the works. Typically the juror is a professional artist or gallerist, sometimes a prominent art critic, and sometimes an artist with a regional, national or international exhibition reputation. What gets selected into the exhibition is his/her decision. Sometimes the works are selected first by image file review and then by direct visual inspection to make sure the work is the same as the image file. I typically do not enter juried shows. I wrote that I entered this show because the exhibition title: Duality: Glimpses of the Other Side was intriguing. My work is abstract and not narrative. My new studio focus is about duality and the serendipity of mismatched twins. I see diptychs as fraternal twins. I like the concept that twins can be the same and also different. Even identical twins can be different (if they try). It takes looking to see how they are different. I intend to focus on diptychs. Recently I interviewed two jurors about the process of how they select works for an exhibition. I emailed Susan Hoeltzel, the juror for an annual show at the Upstream Gallery, 8 Main Street, Hastings on Hudson, NY titled PaperWorks (June 22-July 23, 2017). I am a member of this artist-run gallery and helped hang (install) the exhibition that includes a large and beautiful array of paintings, drawings, 3D sculpture and other works on paper submitted by local and regional artists. Gallery members do not enter or show work in this exhibition. The juror came to the gallery to see the exhibition after it was installed. I didn’t meet her and emailed her to ask how she selected the works for the show. I told her that gallery members were very pleased with the works she selected. I did not tell her I helped install the show. She replied: Thank you – I also think the exhibition looks great and extend my congratulations to the people who installed the show (It’s not that easy to hang a group show and the people who installed this one were sensitive to the transitions between the works, making it visually pleasing and leading the viewer from one work to the next.) I took that as a compliment. She wrote: In choosing the work, I was simply looking for strong work that represented a broad range of approaches – style, content, media, etc. She added she was working without information about dimensions, so was trying to make sure not too many works were selected for the space. It’s a big space and there are a lot of works to see. Susan Hoeltzel is the former director of the Lehman College Art Gallery, City College of New York. Susan has exhibited her mixed media drawings on canvas nationally and internationally. Her works explore objects and the meaning we construct around them – about illusion and what we infer from the flat, two-dimensional surface of the work. Her most recent series deals with plants, particularly invasive species. I spoke with the artist and educator Stuart Shils in person July 15 at the opening reception for the 9th National Juried Exhibition at the Prince Street Gallery, 530 West 25 Street, NY, NY (July 11-29, 2017). The image nearby is me standing in front of my collage titled Amok at the Prince Street Gallery opening on July 15. I submitted 3 entries that are part of a new series titled Curvy Geometric. Amok was accepted, seen here on the wall above another framed work. Amok is made with painted papers, magazine text and tan Washi papers with thin bamboo sticks. The Washi papers add a transparent layer. I’m a layerist. This framed work is 18 inches by 17 inches I was pleased that it was installed in the gallery on a small wall with only 4 works. There were about 50 works in the show, mostly small in size, mostly paintings. I met the juror at the reception and complimented him on the exhibition he selected. I asked him to tell me how he chose. He said he picked what he liked. Simple. The show includes 45 artists. He said he rejected about 300 entries – that means 1 out of 7 artists was accepted. I said I was surprised to see so many semi-abstract and abstract paintings in the show. I checked Shils’ website before I entered the Prince Street Gallery juried show and basically entered because the juror’s works look like abstract paper collage. I asked Shils to tell me about his paper works. His answer surprised me. He said his work is not really collage. He said he puts papers together and then disassembles the work after he takes a photo. The product is the photo. It’s a collage concept. I did not ask if the photo is material or immaterial. See works by Stuart Shils online, including window collages, painting, monotypes, drawing, photography, video and a book with his photographs titled “because I have no interest in those questions…” (Sold out). I remember a comment I heard many years ago about juried shows in a seminar led by the artist Kay WalkingStick. She is an American Artist and one of today’s most accomplished Native American contemporary landscape painters. She basically said – don’t be upset if your work is not selected in a juried show. In some cases your work doesn’t fit the concept the juror intends. In some cases, the other works submitted are so different from what you submit that your work will look like it doesn’t belong in the show and that’s why it’s not accepted. She added: in some cases your work is so much better than all the rest that it can’t be included because all the others will look terrible in comparison. AND there are probably other reasons. Try to be positive. Maybe the juror doesn’t like your work. Don’t take it personally. Please add your comments. Tell me if you’ve been a juror and how you made your decisions. If you’re an artist, tell me if you enter juried shows. Tell me if you love or hate the process. Share what you know. I submitted two diptych paintings for a juried exhibition titled Duality: Glimpses of the Other Side at to the Islip Art Museum. One diptych – titled Blue Triangle Diptych (nearby) was accepted. One diptych, titled Blue and White Triangles (below) was rejected. The juror was Scott Bluedorn, an artist who lives and works in East Hampton, NY. The exhibition is June 24-September 17, 2017. The reception date is June 24th from 8-11. The Islip Art Museum is located at 50 Irish Lane, East Islip, NY 11730 on Long Island. Gallery hours are Th/F 10-4 and S/S 12-4. I don’t typically submit works for juried shows but was intrigued with the theme and the wording in the prospectus. It asked artists to “seek out what’s hidden behind the veil of perception to reveal chaos in the mundane, beauty in the ordinary, and depravity in the wholesome.” I don’t see how my work is veiled, depraved or chaotic, but I suppose my approach to layering with paint and papers implies veiled perception – something below the surface. I am interested in duality. The diptych is my approach to expressing duality. I work with painted papers and collage. The media is dual. In the first diptych, one panel has painted paper collage and one panel is a painting in acrylic. Each includes triangles but the configuration is not parallel. Each panel is 24×16 inches. Together, the diptych measures 24×32 inches. I like the interplay between mixed media – collage and painting, paper and paint. The Blue Triangles Diptych was never intended as a diptych. Each panel was created to stand alone. By chance, I placed them next to each other against a wall in my studio (I was re-organizing space). I liked what I saw and I decided they belonged together – it was serendipity! I think of them as fraternal twins. I have a skinny, 16-page paperback catalog titled Contemporary Diptychs: Divided Visions. See it nearby. It’s an old catalog from a 1987 exhibition. I found it while browsing for art books at the Strand Book Store (828 Broadway and 12th Street in NYC). I loved the cover image and the essays about diptychs inside. If you haven’t been there, you must visit the Strand. It’s a great destination for art book lovers. The catalog cover image shows a contemporary diptych titled Slope of Repose, by the artist Edward Henderson, dated 1986. The catalog has the same title as the exhibition – Contemporary Diptychs, Divided Visions, – and includes essays written by Roni Feinstein, formerly Branch Director of the Whitney Museum of American Art, Fairfield, CT. Feinstein organized the exhibition at two Whitney Museum branch locations – one at the Equitable Center in Manhattan, 787 Seventh Ave., NYC and another at at the Whitney Museum branch in Fairfield County, Stamford, CT. Both shows were in 1987. The exhibition catalog is still available online. According to Feinstein, the first diptychs were tablets consisting of two pieces of wood with writing hinged together. In the late 16th century, diptychs were used primarily for companion paintings with portraits of a husband and wife, intended as a pair, but also visually independent. The contemporary revival of diptychs in the 1960s was more about conceptual art – dealing with issues of narrative and allegory, autobiography and self-expression, social, political and cultural commentary. The essay about Edward Henderson’s diptych Slope of Repose (image is seen above) says: “Things are not exactly as they seem. The left side may look like a collage with pasted newspapers and other elements, but it’s a trompe l’oeil painting. What looks like a wooden bar running down the middle is actually painted to look like it’s real, and the right side panel shows a letter N (an apartment house) but is assembled from thin strips of balsa wood. What seems to be collage on the left side is painted and what seems to be painted on the right side is collage.” The diptych makes you ask – what is real? I am pleased to be included in the exhibition Duality: Glimpses of the Other Side at the Islip Museum, and can’t wait to see the various works that were accepted in this annual show. Long Island is a lovely place for a day trip in the summer. If you are nearby, please stop by and see the exhibition. Let me know what you think. See directions to IAM here. Let me know what you think about contemporary diptychs and the idea of duality. I belong to an artist’s collective. We meet in each other’s homes or studios once every 4-6 weeks. We discuss current studio practice, and critique works in progress. We know each other well. Our meetings always include great food and conversation. We share tips on new materials, museum and gallery shows to see, lectures to attend, books to read, and workshops we offer or attend. If you don’t have an artist’s group of your own, I recommend you find one or start one. The group dynamic should be cordial and respectful. Enthusiasm and energy are a wonderful bonus. At a recent meeting, I talked about Serendipity, surprise and my fascination with the unexpected. I talked about how I love to design collage workshops, and about a portrait collage workshop I led in 2011 at the Newark Museum. The workshop was inspired by an image I found by Jean Dubuffet (French, 1901-1985). Dubuffet’s image was made with insect wings. We don’t do insect wings in museum workshops. We use magazine papers and typical collage media. I said yes when Ellen asked me to share the workshop lesson plan. Sharing is good. I appreciate Ellen’s talent, and know she has a great reputation for her classes and workshops. I sent her a link to my blog post about the Dubuffet butterfly collage workshop. Read it here. I’m posting this blog to share the project with you. The image below is by Jean Dubuffet. It’s titled Sylvain and is 6″ wide and 10″ tall. It’s all insect wings carefully glued down. Are you disturbed that it’s made with dead insects? Dubuffet wanted to shock you. I’ve seen contemporary collage with actual butterfly wings. Some are quite beautiful. My workshops don’t include a supply of insect wings or butterfly wings. We use magazine papers cut in butterfly shapes instead. Notice the Dubuffet portrait (above) has eyes, nose, a mouth and teeth. At the workshop, we worked with magazine reproductions of eyes and mouths. Show everyone a color copy of the Dubuffet image. Discuss how the insect collage is made. Demonstrate how to cut and paste overlapping butterfly shapes. I asked students to study the Dubuffet portrait and decide if they would have eyes and a mouth. I asked them to look at magazines and select papers to cut into butterfly shapes. I asked them to think about how many papers they would use and how close or far apart they would place the papers. I asked it they would glue the papers flat or leave edges projecting. Notice the yellow profile in the first image faces right. See the blue outline inside the cut shape. It shows the artist’s hand. The magazine papers are multi-colored. Some are patterns and some are text. The yellow paper profile includes a large smiley mouth and two eyes. I see a sloped nose, multiple lips and chin on the right side, so this face has more than one mouth, one is smiling and one is not. There’s a front view portrait and also a profile. The features are juxtaposed, quirky and fun. I am always surprised when I see this image. Notice the blue butterfly collage below. There is almost no yellow paper profile to see – only a small section of yellow paper peeks through on top. Notice there’s a single blue eye looking through. Can you find it? 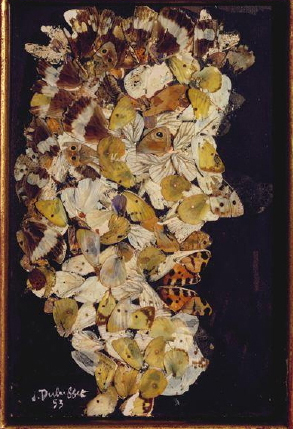 It’s surrounded by paper butterflies – a white butterfly on the left, a blue butterfly above, and a black and white butterfly below. 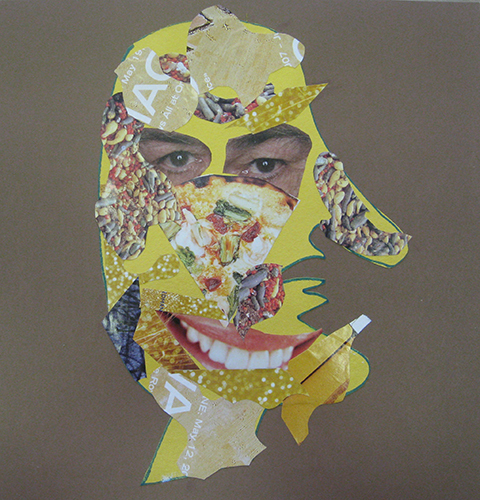 This “portrait” is about carefully cut and pasted, layered magazine papers. See the yellow profile in the collage below. It’s the sample drawing I provided. Notice there’s a magazine image of an eye placed where you’d expect to find an eye. There’s a red butterfly shape that defines the ear and several other butterfly shapes overlapping each other, including cut papers that look like light brown hair. I enjoy this collage for the bubble text that let’s you know this portrait has something to say! Dubuffet used insect wings to create something unexpected. I wanted the workshop to be about Serendipity and surprise. Every collage was a surprise. The first collage juxtaposes papers to create an unexpected portrait. The second collage creates colors and shapes in layers and obliterates the portrait (except for the eye). You have to look hard. 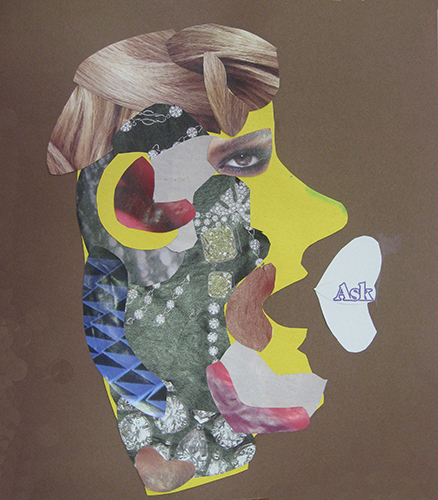 The third collage creates a personal narrative and makes you ask what the artist wants to say. In a blog dated July 27, 2011 “Art: Learning to See” I wrote – “Becoming an artist is all about learning to see and understanding how you see. At the end of the Newark Museum mini workshop, one student commented: it was a good workshop – What we did was learn how to see. How perfect! That’s exactly what I planned. Please add your comments below. Tell me how you do collage and if you work with magazine papers. Tell me what you think about Dubuffet and his insect portrait. My workshop – Cherry Blossom Collage with Cut Papers is scheduled for Sunday, April 15, 2012 (10-4) at the Newark Museum, Newark, NJ. Think PINK. The workshop is all about delicate pink flowers and spring. The timing is perfect. In Metro New York/New Jersey and the surrounding suburbs, the trees are in flower. The colors of spring are all around us. In preparation for the workshop, I visited NY Central Art Supply at 62 Third Ave., NYC to buy hand made papers from Japan (and Thailand), bark paper, and delicate pink papers for the workshop. NY Central has a world-famous paper department. I think collage always starts with the paper. Some people like to work with natural papers. Some like to work with decorated papers. I like to paint papers and create a custom palette for collage. I like to work with papers that are hand-made and natural, and also work with papers that are machine made, printed and textured. I will bring papers, paints and a sample collage to the workshop. I will bring cherry blossom images to inspire. I will bring a sample collage that shows a stylized Japanese landscape with a winding river and trees in blossom (see the image further down this post). We will build a collage in paper with color, texture and pattern. 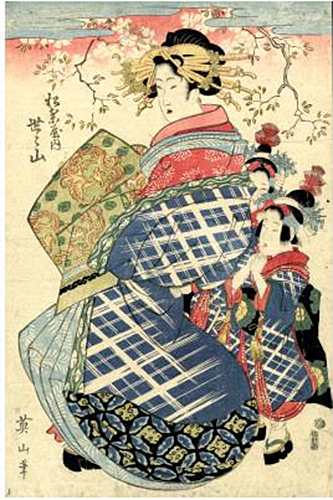 The vintage image above shows a courtesan strolling in the garden in spring. It is included in the exhibition titled Poetic Pastimes: Japan and the Art of Leisure that is currently installed at the Newark Museum, Newark, NJ (through May 6, 2012). The exhibition is the inspiration for the workshop. Image: courtesy the Newark Museum. Poetic Pastimes is a celebration of the seasons. As you enter the exhibition, you see spring, followed by summer, autumn and winter. The exhibition includes over 150 masterworks from the Museum collection, including prints, paintings, lacquer, textiles, ceramics and more. In Japan, from the time of the Heian Period (794-1185), poets, singers, aristocrats and members of ordinary households would gather around cherry blossom trees to appreciate their beauty. 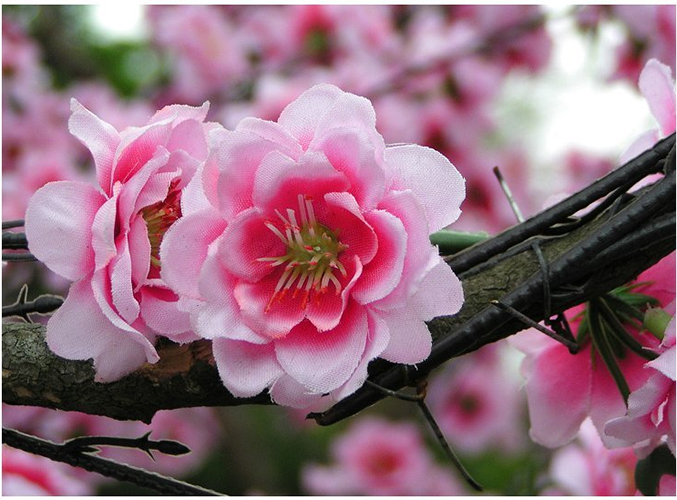 It became a national pastime in spring, and the cherry blossom tree became a highly revered species in Japan. Cherry blossoms are the national flower of Japan. Newark NJ has the largest and most diverse collection of cherry blossom varieties in the U S – bigger than the national display in Washington, DC. Here’s a link to the Essex County Cherry Blossom festival in Newark, NJ. The image (above) shows the sample collage I created for the workshop. The horizontal background is 11×14 inches ledger paper painted a light spring green. 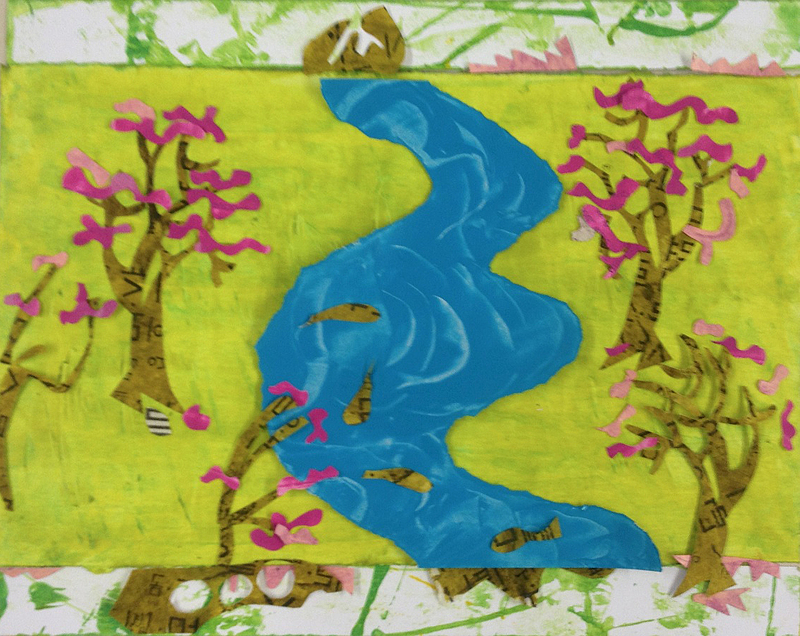 The meandering stream is a collage element in bright blue and the 5 flowering trees with pink cherry blossoms are more cut painted papers. The top and bottom strips are the reverse side of painted papers with additional brown and pink collage elements. The image (above) shows step one in painting papers. I used Golden Paints “open” acrylics in green gold mixed with Atelier “interactive” transparent yellow. I used Golden satin glaze medium to thin the paints and make them more transparent (you can use any brand of acrylic medium). I used an ordinary plastic disposable plate and a plastic palette knife. I painted papers in multiple layers. I cut 2 long, thin strips from the top and bottom of the background paper and painted them deeper green for a border. Painting papers with a palette knife, and mixing layers of color is fun and easy to do. You can experiment as you paint. If you don’t like a color, paint over it with a lighter or darker color. Leave areas uncovered as you add a new color, or scratch (etch) into the color as you paint. Paint as thick or thin as you like. Acrylic colors dry darker so you will always be surprised. 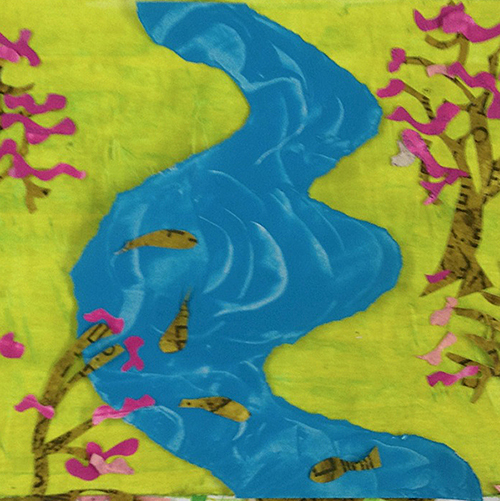 The image above shows a closer view of the stream with fish, overhanging trees and flowers. I drew the outline of the stream on an 8.5×11 inch piece of Crane’s cotton rag paper. I used a soft lead pencil (4B) and drew and erased several versions until the curved shape of the stream seemed right. I tore the paper along the curved line by hand with a steady motion (slowly). The cotton paper is easy to tear. As I painted, I etched waves into the blue paint with the tip and side of the palette knife. The nice part of painting the stream on a separate piece of paper is you can see how the dried color looks against the background color, and if you don’t like the color relationship, you can repaint. You also have the ability to move the paper stream around on the background to exactly the place you want – and can create the best design when you are ready to glue down the papers. 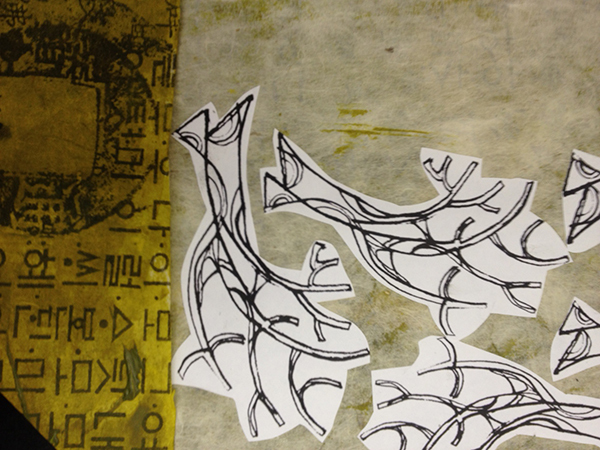 The image above is my line drawing for trees in the collage. I reduced and reversed the image from one tree to make 5 trees, produced a single sheet of paper with all the images and glued the drawings to the back of a sheet of painted rice paper to make it easier to see and cut out trees. I will bring a stream template and the tree templates to the workshop and people who don’t want to make drawings can use my templates. 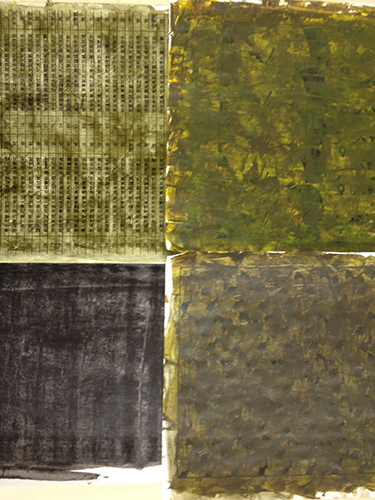 The image above shows 4 sheets of painted papers in different colors ranging from yellow green to brown to black. 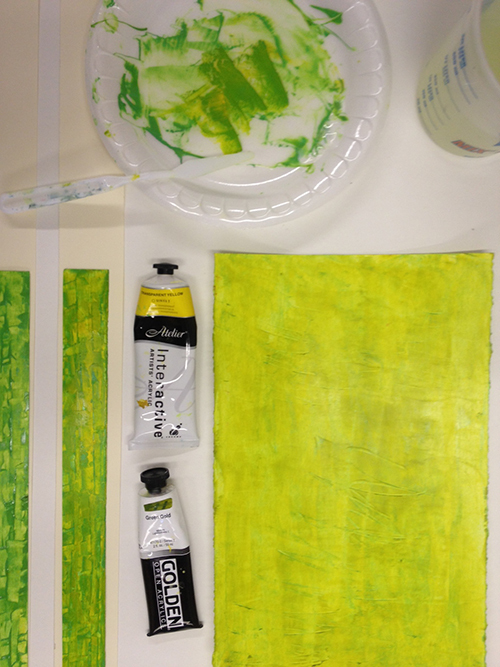 On the top row the yellow green is nickel azo yellow mixed with a small amount of raw umber. The darker green includes the addition of chromium oxide green. The bottom row black is a thin layer of Mars black. The brown is raw umber over nickel azo yellow. I painted over ordinary copier papers printed in black toner ink. I planned to use the papers for the trees in the collage, but didn’t like the paper and I didn’t like the colors. 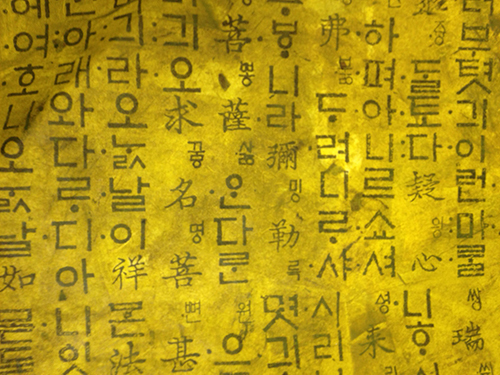 The image below shows Golden nickel azo yellow acrylic painted over Japanese rice paper. I like the way the paper accepts the paint and I like the size of the text that shows through. Here’s a link to the color chart for Golden Paints heavy body acrylics. You can see how many different colors are available. The image below shows the tree patterns I created. I glued them to the reverse side of the painted Japanese rice paper. I was careful as I cut around each tree. Some of the little branches got chopped, but I was able to piece them back together. 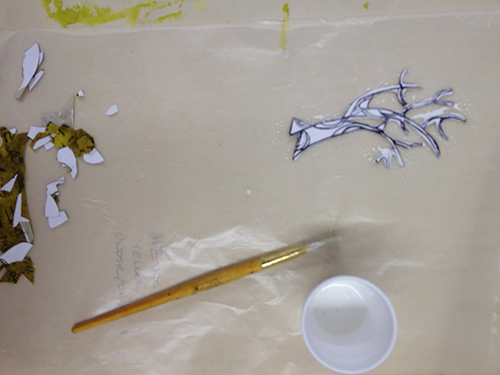 The image below shows my bristle brush (for gluing), a tiny plastic cup with white PVA glue, and a cut paper tree – all sitting on a piece of waxed paper. I use the waxy paper as waste paper and as a barrier sheet when gluing. The size of the brush will vary with the size of the papers I glue. The type of glue will vary depending on the type of papers in the collage. For thin paper, I use acrylic medium. For medium weight paper, I use PVA white glue. For thick paper, I use carpenter’s glue. Notice the multiple pieces in brown and white papers left over from cutting out the tree. Matisse used every piece of paper in his cut paper collages, and I found a way to use the snippets in the cherry blossom collage. The image below is pink painted paper (painted on imported Indian paper). The pinks are made with white and deep pink acrylic paint. On the same table is the sample collage with assembled painted papers. Everything is sitting loose, ready to be glued. Notice the horizontal strips at the top and the bottom of the collage. These are the reverse side of the same paper strips that are painted green (seen in an image above). I planned to use the green strips but liked the reverse side better. I call it “serendipity” when you find something unexpected that you like better than what you planned. The final plan for the collage includes leftovers from cutting the trees and flowers. I wanted to bring these papers into the borders. Nothing goes to waste. I will bring hand-outs about the history of Japanese papers – called Washi – to the workshop. I will bring pink, white, blue, green and yellow acrylic paint and plastic palette knives to the workshop. 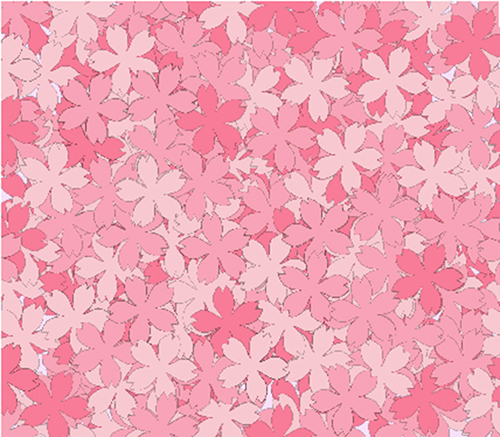 I will bring color copies of contemporary cherry blossom designs (simple flowers in an overall pattern like the sample below) for people who want to make a collage that is abstract. 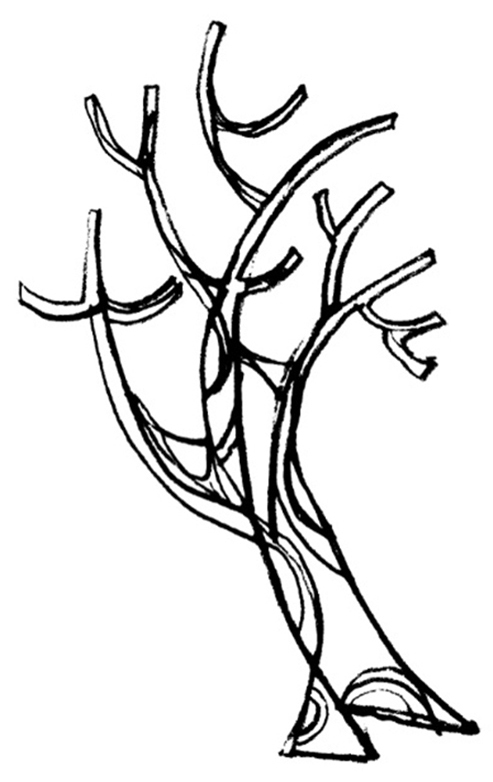 I will bring color images of tree branches in bloom for people who want to make a collage that is naturalistic. 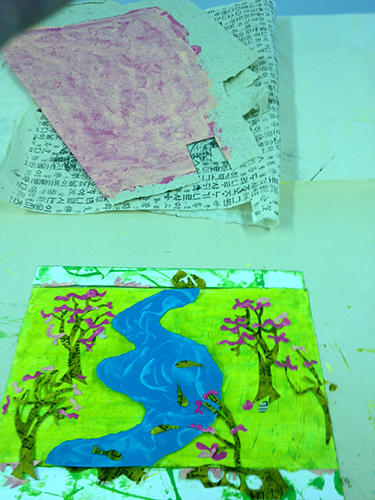 Some participants will want to paint background and branches and add cut paper cherry blossoms. I will bring copies of a courtesan for people who want to include these images. If you take the workshop, all tools, glue, water media paints and papers are provided so you can create a colorful collage painting. 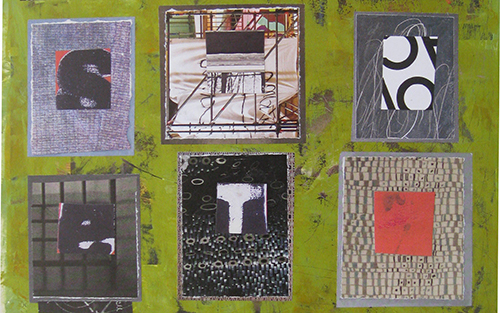 Participants can bring their own decorative papers and make their collage more personal. The workshop is 6 hours and there is ample time to finish a collage. Would you believe me if I tell you my life is about glue? I like to take things apart and put the pieces back together. I love paper. I want the pieces to stick. I like to juxtapose elements, mix and match media, and embellish with layers of paper, paint and ink. My thinking process is also like collage. I like to play with ideas and explore theme and variation and I like multiple choices. I teach collage workshops and classes (collage is so contemporary and so user friendly). I plan a theme for each workshop to jump-start the process. Surprise! In many cases, people arrive with their own plan of what they are going to do (or not do). It’s important to me that each person feels they do it their way. I never want to control input or outcome. I won’t touch their work with my own hand. We do dialog. I show images in the books I bring along to augment their ideas. I typically do not know in advance who is registered for a workshop. I have to find out who they are when they arrive – so I ask people to tell me about themselves, if they’ve worked with collage or another media, what they like, and what they want to learn. I want to share an interesting story. Last summer I led a 6-hour workshop at the Newark Museum (Newark, NJ) titled Narrative Collage attended by adults, including identical twin sisters about age 50. It was almost a disaster. One twin was keenly interested in the workshop and the theme narrative collage. One twin was keenly disinterested and verbally antagonistic to her twin about being there. It was bizarre. It was hard to persuade the resisting twin to participate. But I am persistent and have my ways. I showed her a book highlighting the life and work of the artist Ray Johnson (American 1927-1995). I had a hunch she would like to know about his work. I am a great fan of Johnson’s work. Johnson is known as a collage artist extraordinaire and has been called New York’s most famous unknown artist. Black Mountain College Dossiers #4 (Ray Johnson) is the title of the book I brought to the Newark Museum workshop. It includes collage images and an essay “With Ray: The Art of Friendship” by William S. Wilson (It’s an old book, and for some reason it’s very expensive online). From 1946-48 Ray Johnson studied alongside Robert Rauschenberg and Cy Twombly at the experimental Black Mountain College in North Carolina. Faculty members included Joseph Albers, Robert Motherwell, John Cage, Merce Cunningham, Buckminster Fuller, Willem and Elaine DeKooning, and others. After Black Mountain, Johnson moved to Manhattan (NY) and showed annually with the American Abstract Artists. He is connected to the history of Neo-Dada, Fluxus, and early Pop Art. In his own way, he invented performance art and Happenings (he called them “nothings.”) He is credited with founding the MAIL ART movement – he called it the New York Correspondence School, and it still exists today. The above image is titled Four Eyed Bunny Postcard – November 26, 1977. 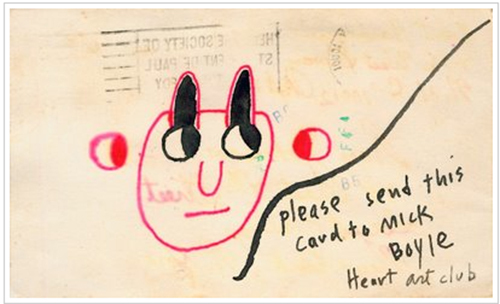 See more images of MAIL ART sent from Ray Johnson to Mick Boyle. The New York Correspondence School participants circulated and re-circulated lists, group portraits, reports, announcements, insider commentary and snippets of media that was an open-ended collage of gossip about members and the NY Art World. Johnson said: I had this stockpile of materials, so I put them into envelopes and mailed them off to everybody everywhere. I’m very fond of the idea of the message in the bottle…and the chance of it being found or never being…That’s pure romance. When he made an error in typing, he often took off from the error, not from the word he had intended to type. The collage seen above is titled Taoist/Toast! (1957) 5×4 inches, is in the collection of William S. Wilson (reproduced in Black Mountain College Dossiers #4). It’s possible the twin found this chapter in the book. It brought her back into the group. I think – maybe – she is now a great fan of Ray Johnson’s work. She began to work in earnest and made a collage inspired by one of the images in the book. In research on Ray Johnson, I learned about a documentary video about his life titled HOW TO DRAW A BUNNY (2002) directed by John W. Walter. Johnson loved to recycle old works into multi-layered new works. He loved collaboration. His MAIL art included bunny head portraits, puns and rhymes. 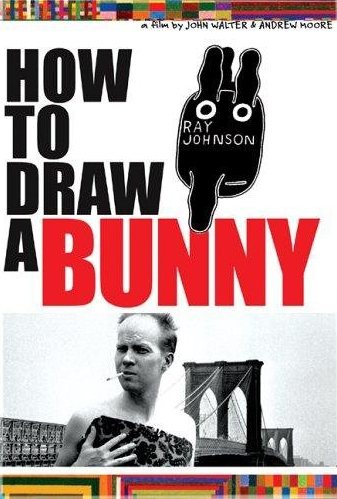 The image above is a portrait of Ray Johnson, his logo bunny and the title of the documentary How To Draw A Bunny (image: the Internet). 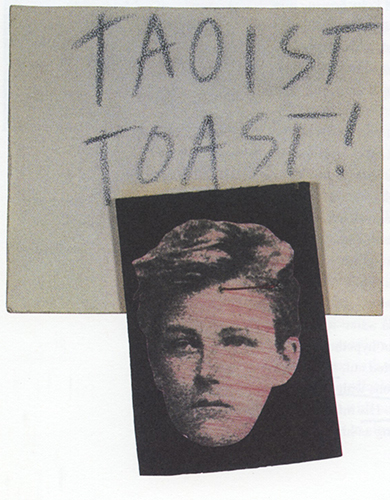 You may know Ray Johnson committed suicide in 1995. He jumped off a bridge, paddled backstroke and disappeared in the waters near his home in Long Island, NY. Thank you for visiting…let me know if you’ve seen the documentary HOW TO DRAW A BUNNY. I am a great fan of Calvin Tomkins who writes brilliantly about contemporary art and artists. His book LIVES of the ARTISTS includes in-depth profiles of Jeff Koons, Damien Hirst, Matthew Barney, Cindy Sherman, Richard Serra and others. The book is exciting to read, filled with personal information and critical insight, and would be appealing to everyone who is interested in art and artists. Tomkins writes: contemporary art is all about choices. I’m a collage artist. Collage is the most contemporary art medium, accessible to everyone. Collage is all about choices. I got a phone call from Stephen McKenzie, the manager of Adult Education in the Visual Arts at the Newark Museum (Newark, NJ). He asked me to lead a mini collage workshop this past Saturday for museum members. I chose to say yes. I wanted the opportunity to promote two upcoming workshops, and, as always, to promote creativity through collage. In May I did a very successful workshop titled Possibilities with Paper at the Museum. I am scheduled to teach Possibilities with Paper 2 and 3 in August and in October. There are so many possibilities. Collage is the perfect contemporary media. I gave a lot of thought to what the Newark Museum mini workshop would include, and wanted to offer a project that would encourage looking and promote understanding visually. I will teach Possibilities with Paper 2 at the Newark Museum on August 7, 2011, and will teach possibilities with Paper 3 at the Newark Museum on October 30, 2011. See more information about the 2 workshops. 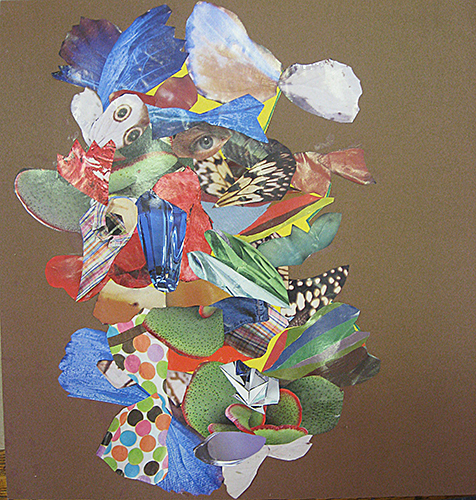 I will teach a Colorful Collage workshop on July 17 at the Pelham Art Center. Last year I taught 2 workshops at the Newark Museum inspired by Romare Bearden. One was titled Caribbean Landscape. 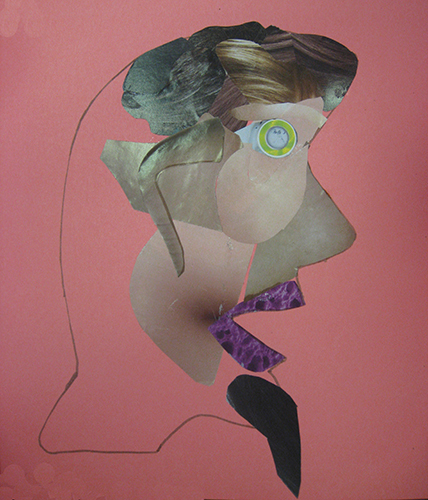 Another was titled Conjur Woman: Portrait in Collage. Each full-day workshop is 6 hours – long enough to complete a collage. The two mini workshops would each last 90 minutes so the project had to be simple and not take too long to complete. I wanted everyone to be able to start quickly and have enough time to finish. My top choice was Romare Bearden because this is a special year (the centennial of his birth) and many museums and galleries are honoring him with retrospective exhibitions (including the recent show at the Michael Rosenfeld Gallery on West 57 Street in New York City). The exhibition closed May 21, 2011. See works by Romare Bearden online at the Michael Rosenfeld gallery website. I wanted people to see and understand how Bearden constructed his collage images. But I was also concerned that it would require more time than was available. “What I expect from any work of art is that it surprises me, that it violates my customary valuations of things and offers me other, unexpected ones. Art doesn’t go to sleep in the bed made for it. It would sooner run away than say its own name: what it likes is to be incognito. Its best moments are when it forgets what its own name is. The image above is titled Sylvain. It’s 10×6 inches. It’s a collage made with insect wings. Everyone got a color copy of the Dubuffet image and the quote. I read the quote aloud. I discussed how the image was constructed with insect wings – and also pointed out that there was an eye and teeth that could be on top or below the other papers. Everyone was instructed to cut out the profile drawing and either trace or glue the drawing onto the larger sheet (and they got to choose where to place it). I did a demonstration on how to apply the glue. I suggested that they notice how Dubuffet limited the range of colors and try to select papers in a similar tonal range. The rest was up to them. They chose how to proceed and what images, patterns and colors to include. See samples of their work below. Notice how each one is unique. I was attracted to Dubuffet’s quote and art and connected both back to a comment by Calvin Tomkins in LIVES OF THE ARTISTS. He described Jeff Koons and Damien Hirst – contemporary art stars – as the reigning heirs of deliberately outrageous art that feeds off the corrupting influences of capitalist glut and entertainment. Dubuffet called his work Art Brut. He created with common media. His art was not high brow and he created deliberately outrageous art. See Damien Hirst’s butterfly winged art (done in 2003), and read the review. Thanks for reading. Please add your comments below. Collage artists typically work with appropriated images (on-line and print). I recently wrote about ON LINE: Drawing Through the 20th Century at the Museum of Modern Art (the show closed Feb 7, 2011) – and talked about Paul Klee’s reverse drawings in the exhibition. I make reverse drawings and understand the process. I was so inspired by all the lines, I immediately made a collage with line drawings. But I didn’t make the lines. The drawings are small, appropriated papers – reproductions from periodicals like Artforum Magazine. I found the papers and put them together. I like the lines. Everything is very graphic. But they aren’t my lines, and I can do my own. All collage artists are concerned with copyright infringement, what they can take and how they can use it. Some things are too easy and you shouldn’t use other peoples images. I tell students in my collage workshops to add papers and paint and embellish found papers to make the images their own (and advise them to take their own photos in related setups if they want to work with photocollage). Some artists make it a point to use appropriated images. That’s their niche. Read about the claims and counterclaims of two hot recent copyright infringement headliners – Shepard Fairey and the AP, and Richard Prince and Gagosian Gallery. The image above shows a section of a grid with papers, and lines that are straight, curve, criss-cross, and scribble. Can you see any famous artist’s work? I put the blocks together, and added 2 or 3 smaller papers to modify each block, then put everything on a painted green background (substrate). The individual blocks very in size from 2 1/2 x 3 inches to 3 x 3 1/2 inches. I like the variety, but decided I don’t like the idea that the lines aren’t mine. 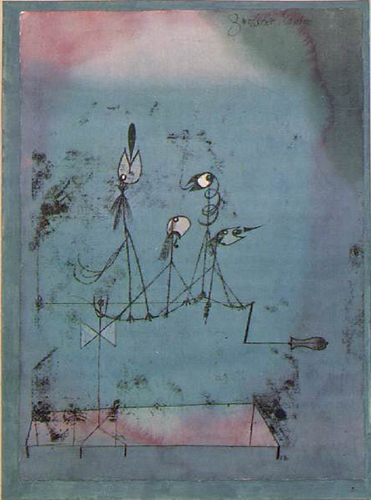 Paul Klee did reverse drawings. Two were included in the MoMA exhibition and both are in the MoMA collection. The first drawing is titled The Angler (1921) It’s oil transfer, watercolor and ink on paper with watercolor and ink borders on board and is 19 7/8 x 12 ½ inches. The second drawing (see it nearby) is titled Twittering Machine (1922). It’s oil transfer, watercolor and ink on paper with gouache and ink borders on board and is 25 ¼ x 19 inches. You can do a reverse drawing and nobody will know it’s a drawing because the drawing is on the back of the paper. The front (the reverse) looks like an etching. You’ll get a very interesting line. Materials are basic: You’ll need paper, oil paint (or oil-based printing ink), a disposable paper palette, a metal palette knife, a print brayer and some mark-making tools like pencils, a ballpoint pen, and a wooden spoon. The media has to be oil, not acrylic or water-based inks because only oil will stay moist long enough to do the transfer drawing. Other materials you will need: drawing or printmaking papers cut to the size you want. To start, squeeze a small amount of paint or ink on the disposable palette and spread it across the palette in a simple line. Work with the print brayer to create a smooth film of paint or ink over a large area of the paper palette (or spread the media with the palette knife). Use any color oil paint or oil-based ink you want. I like brown, black and green. After the color is spread on the palette, lay a clean piece of paper carefully on top. Don’t press it down. Don’t touch it or your fingerprints will show on the reverse side. Your paper can be smaller than the paper palette and smaller than the ink or paint you’ve spread, or it can be as large as the paper palette (or even hang beyond it). Have fun drawing with a pencil, pen or another mark-making tool. See how gently or how hard you need to press down to get the line transfer you want. The image will be in reverse. You may even like the image backward. Some of your reverse drawings will be winners, and like Paul Klee you can add watercolor paint, ink crayons or pastel. Some of your reverse drawings will be less than perfect, but ideal papers for collage. Try to write backwards in your reverse drawings. Try to do the drawing without a pen or pencil so you don’t see the lines as you are making them. Surprise yourself. If you want to write text you can read, write it backwards, so it will read forward on the reverse side. Or write your words on tracing paper first and flip the paper over, then look at it in reverse as you do the reverse drawing. You can look at a drawings when you do the reverse drawing if you want to draw from something in front of you. See my reverse drawing faces at my website. I did variations of a single drawing by changing the speed and direction of the lines I made. I also changed the amount of oil paint on the paper palette (some thicker, some thinner), and changed the pencil or pen. 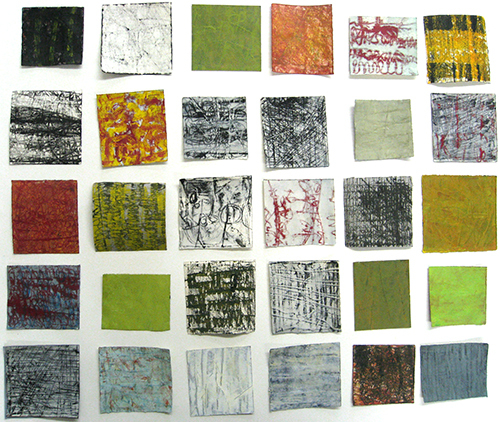 I just made reverse drawings of lines on small pieces of printmaking paper for a new collage. I placed the drawings in a grid of 3 across and 4 down, then reorganized them into a larger grid. When the grid was enlarged, almost all the pieces needed to be adjusted. Some of the drawings were too bold. Some were too busy. As individuals they were good, but in a group they were competitive and had to be toned down. So I added layers of oil paint to some to make a few lighter and others darker. I added a little yellow to warm up the white and black. It made grey green. Then I needed to add a vibrant green to add punch. I put the pieces on a large beautiful sheet of printmaking paper – ready to collage. It’s not yet glued down. So it might change before it’s finished. In collage, things move (even a little) as you lift them up, turn them over, coat them with glue, lift them back up, and, finally, place then down on the substrate. I call it serendipity. Are you ready to draw? Please let me know if you need more information about reverse drawing. Thanks for sharing your comments.